We have teamed up with Packt Publishing to organize a Giveaway. 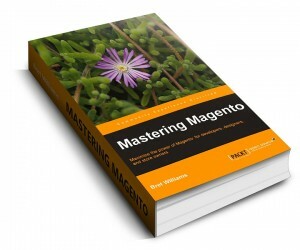 Four lucky winners stand a chance to win copies of the latest book on Magento – Mastering Magento by Bret Williams. All you need is to look through the description of the book and drop me a line at irina@belvg.com, explaining why you are the one of four who is extremely interested in Mastering Magento. Besides, you should become a fan of our BelVG Facebook Page or follow us on Twitter. The contest will start now and will be closed on 02/10/12 PT. Winners will be contacted by email at the beginning of October. Mastering Magento is the perfect companion guide for both newcomers and experienced Magento users. Designers, developers and store owners alike will have a better understanding of how Magento works, and how to take advantage of Magento’s immense power to create online stores that help you sell. Get more speed and performance from your Magento store using only a few simple techniques. Learn how to leverage Magento’s SEO features for better search rankings. Learn how to build and manage Content Managed (CMS) pages and content. Includes a complete configuration guide for launching your new Magento store.